I want to make a big impact with the read alouds I choose for the first day of school. Yes, I read picture books to my 7th & 8th graders. I want a quick text that we can all share to start creating our classroom community in a positive way. I want my students to see the value and depth of picture books no matter how old they are. I want my students to know I will be reading aloud to them throughout the year (not only to model fluency, but because we are never to old to appreciate a read aloud). I want my students to continue to have fun experiences with reading and enjoy a book all together. I want the message I send on the very first day of school to be one of a love of reading and appreciation of literature in all of its forms. Picture books let me do everything I want to do on that first meeting with students. This summer I made it a goal to read more widely in the picture book area. Previously, the book I shared with students on the first day of school was THE NAME JAR by Yangsook Choi. The power of that book for me was that I could share a personal story about the importance of names, that it is every child's right to be called by their name (in whatever variation that may be) and have it pronounced correctly as a part of their identity, it's written by an author who has personal stories about adapting to a new culture, it's a beautiful book and story, and it is a great segue into introductions and my making sure I have the correct name and pronunciation for each of my students. This year is the first time that I will have a group of students for the 2nd year in a row, so it was time to decide on new first day of school read alouds for my incoming 8th graders (who I taught last year as 7th graders - I will probably still use the same one I've used before for my incoming 7th graders because I like the message it sends about building our community from the start). The great thing is that I won't have to waste any time in getting to know you activities because we all know each other already, so we can jump right into the learning and reading. In thinking about all of the picture books I read aloud to this group last year (and there were many) and all of the new ones I've found this summer, and what I know about this class of students from last year and their group dynamics, I realized I wanted to tailor the theme of the books I chose to what I think they need and what I want to focus on from the start of their 8th grade experience. What I realized is that there were three picture books I read that all related to themes of friendship, supporting each other, and courage. 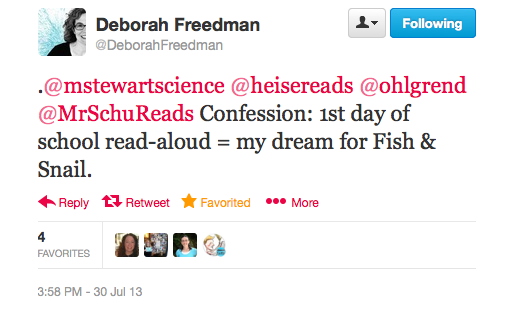 Thus, my first day of school read alouds for my 8th graders this year. *I'm also very much looking forward to being able to rethink this every year for my incoming 8th graders based on what I know about that group and how I want to start our year. If you haven't read any of these, I highly recommend that you do. Happy reading! What are you planning on reading to your students for the first day of school? How are you deciding?